Peter believes he has the best job in the world. He enjoys hearing the stories of couples and using these stories to create a memorable wedding ceremony. Prior to becoming a wedding celebrant he was a teacher and also facilitated personal development courses. For the past 12 years he has organised a monthly "Evening of Storytelling" where writers, poets and musicians come together to ply their creative talents. 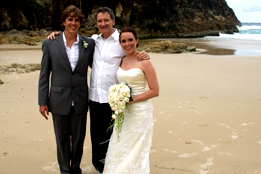 Peter’s experience allows him to create the intended atmosphere for your wedding ceremony; whether it be a relaxed beach or garden wedding or perhaps a more formal chapel wedding ceremony. You can be assured it will be memorable (for all the right reasons!). Peter’s "Personalised Plus" wedding package ceremony includes the writing and recital of a poem which has always been highly valued by couples. From the bottom of our hearts - thank you for your efforts yesterday. 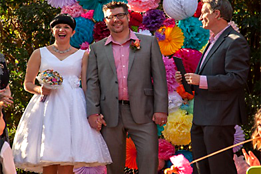 People commented that they loved the ceremony and appreciated your sense of humour and the relaxed feel to it all. It was exactly as we hoped it would be.